There are two things that are on my mind for most of the time: The desire to be (and become) a better person and to be happy. Both of them are often connected to what many designate as the spiritual realm. For instance, my happiness would not be merely about instant gratification nor mere monetary gain; rather I would like to be able to prolong, expand and diversify my happiness so that it includes and envelops first and predominantly my family, but so that its rays may also reflect upon friends and acquaintances. I believe that once one is in balance with oneself then one finds a certain kind of peace and happiness. Those who lash out or who intend to hurt others or are envious of other people reveal a gap or a want inside; for whatever reason they are not satisfied with who they are or how everything is turning out for them. Most of the unhappy folks may not even accept responsibility, but blame others, their co-workers and bosses, their families, or even their fate and their genes. As we are constantly looking for happiness, we may be led astray or led to believe that it can be achieved via dubious means. In a material world, where success and personal worth are often measured by wealth, it comes as no surprise that we chase the coveted paper. And while our focus is on making money, we overlook the most important parts and aspects of our lives: the people around us and our own spiritual growth. 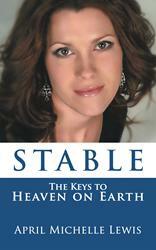 In the book Stable: The Keys to Heaven on Earth, April Michelle Lewis tackles some of these issues by presenting her own philosophy based on her personal experiences. She wishes to show us how we can be stable in our lives, that is to be happy and to remain so and not merely on a shallow level. Happiness from a new gadget or new shoes will last only so long; the question is what can fill us with personal and enduring satisfaction, namely of being happy in our skin. Few of us are. We may accept ourselves and feel balanced once in a while and this tends to be on the odd lucky and bright sunny days, but there is not too much we can do to remain stable. Religions do not generally help much; they may give us (illusory?) moments of security within the confines of a building, but the moment we step out into the real world we either forget or more often we do not apply to the outside what we have learned from those sermons inside the church. Self-help books are temporarily fine, but once we have read them they get shelved and forgotten. According to Lewis, we can find lasting happiness and constant purpose in our lives by following three specific guidelines, which make up the acronym STABLE. They are Sound Thought (ST), Always Believe (AB), and Life of Excellence (LE). She explains each of her stages in detail and with examples and by occasionally referring to science. She also tells us upfront that it will take time and effort from our part so those who expect quick and magical solutions need not apply. But in the end it is worth its salt, and she equates it with finding heavenly bliss on Earth. Lewis is also honest with her own background: She is a devout Christian and I doubt she uses those terms as metaphors. Her religious beliefs can be hard to swallow for some or be a turn off for others. I myself who espouse some Christian values and philosophies felt uncomfortable with this fact, but I found that from the get go, we did strike some common ground. The author believes that organized religion tends to misrepresent and distort the teachings of Christ. Jesus did not want us to judge others and be righteous but showed us to accept each and everyone the way they are. Furthermore, Jesus was not thinking of saving only his kind or his own people. Also some Christians use their Sunday service as an excuse for actually doing good. It is not enough to sing chants or pray to God and then forget about all those values until next week. As Lewis succinctly puts it, those rituals and deeds matter less in the grand scheme of things since God is hardly worried about whether we eat fish on Fridays or not. Religion should be about life and living and should be treated as a practical spiritual guide not as a convenient and lazy shortcut to heaven. Along the same vein, no, it is not enough to profess your belief in the Savior Jesus Christ without having lifted a single finger to do any good in the world. Throughout the book, there are - apart from many religious passages from the Bible - quotes from religious figures, such as Mother Theresa, the occasional hipster, such as John Lennon (his “Imagine” did have the line regarding no religion, just saying), Kelly Clarkson (? ), Pocahontas (?? ), Napoleon Hill, and in terms of science, Lewis refers to some (for the most part positive) psychologists like Martin Seligman and neuroscientists who claim that higher levels of confidence and self-esteem have overall health benefits on the immune system. Yet the most quoted scientific book is that of Jeffrey Long's Evidence of the Afterlife on Near Death Experiences. Although I have not read that particular book, I have been familiar with its general findings. Dr. Long interviewed many people from different cultures, faiths and nationalities who had been biologically brain-dead, and they reported similar experiences: the flashing of their own lives before their eyes, the importance of interpersonal relationships and feelings of regret regarding them, and also the warm and welcoming presence and embrace of a loving Creator. All of them also claimed that the near death experience profoundly affected them and they realized what was important in their lives and what was not. All in all, all our actions should be fueled and guided by love and forgiveness. Jeffrey Long's book is the proverbial pot of gold for believers. I certainly feel that it validates to a degree the existence of an afterlife. In the same way, many Christians, including our dear author here, jump upon those findings and claim that they provide scientific proof for God's existence. Yet it is a little rushed and premature to present the information as facts. Furthermore, I believe it to be rather presumptuous to automatically equate a loving creator with the notion of the Christian God or with Jesus Christ. This is my main issue I have with this book as it claims to accept all faiths, but narrows everything down to its own Christian belief set. Scientific findings are carefully cherry-picked to “prove the one truth (italics in text) that we are all searching for.” The Christian belief goes tightly and rather conveniently hand in hand with the idea of “truth” and I shudder (in some cases even turn away) when I hear or read that somebody claims to know the truth. In fact, her truth is not as universal as she would like it to be. Christians claim to know the truth, but so do Buddhists, Muslims, and Hindus. If all religions are seen as equal or equally valid, then we cannot raise up a particular one on a pedestal proclaiming that one to be the real one. Incidentally, my favorite line is when she purports that many atheists - at least those she has met herself - can be loving and passionate people! This book can be summarized as a self-help book with a religious twist. But if we strip away the religious content from the book, there is still a lot of interesting stuff and helpful advice here. Sure, it will be trimmed down and even altered significantly, but it still has its useful aspects. For instance, there is an element of cognitive, in particular positive, psychology at play. The first phase claims that we should have sound and healthy thoughts about ourselves and about others as a whole. By reinforcing positive aspects, such as personal acceptance and forgiveness, there will be also internal health benefits. We should not let the dark or sad thoughts take over and ought to fight them like military experts and be ready and equipped for assaults and ambushes. It is the nagging voice in our head that tells us we are wrong, unfit or simply ill-equipped for life or that others are responsible for our misfortunes. Instead, Lewis says replace them with positive thoughts (laced with religious tones). The problem with positive thinking is that there will be more thinking as the bright side wants to think the dark side into submission. Lewis believes that once we have control over our thoughts after fighting them “tooth and nail,” then we can choose the happy ones over the negative trash talk in our heads. Moreover, Lewis claims that the best strategy is to attack these negative thoughts, the “cruel stranger” in our head firmly and directly and she even blurts out responses in the grocery store or on the street. Apart from this, she talks to God directly and admits that she has many personal conversations with the Almighty (in her car, in her shower, and at her kitchen sink!). So much so that people think she is crazy for talking to herself. She sees and addresses the negative thoughts as bullies and wishes to “brainwash” herself into bliss (but we should be aware of being brainwashed by the world!). After years of this practice (of self-hypnosis?) we will also find bliss too, according to her. Both the aggressive manner she intends to ward off so-called evil thoughts as well as the fact that part of herself is in constant struggle with another part of her identity makes me think that meditation ought to be a better strategy. In meditation we learn to see thinking as what it is, namely a flow of thoughts both good and bad. Yet we can remain unaffected by both of them and just watch them float by (after years of continuous and strenuous practice, of course). The second principle of Always Believe is more faith-based. I think that it is also commendable. There are dark moments where we do not see or expect rays of hope, but life can give us the reversal of fortunes all of a sudden and at any given time. It usually comes in cycles where out of great misfortune great fortune may arise. So one should never give up but always fight for a happier day. In this sense, God or what I would prefer to call the powers that be have a plan for us and everything happens for a reason. Yes, I do believe in both destiny as well as her sister-in-law coincidence. In fact, there is no such thing as coincidence. Nothing happens in isolation and everything is interrelated. Some years ago, I embarked upon a simple experiment. I made a wish. I asked the universe (God, powers that be) for a specific outcome. In the meantime, I tried my best to reach it of course (you need to work for it too). But guess what? Things that seemed like obstacles before suddenly fell into place, I got the answers and opportunities I needed and in the end, my dream came true and the outcome was indeed what I had wished for (in some cases even better!). So when Lewis says that she would need a computer and then received one in a contest by the grace of God, I cannot but understandingly smile and confirm this. Such so-called coincidences do happen many times over and I firmly believe that they are coordinated from the other world. So yes, believe in yourself and in your life and in happiness and most importantly do not lose the childhood ability to wish for things. And needless to say, always try and give your best. The final stage is called Life of Excellence, and by this she means that one must behave in accordance with one's beliefs. That is definitely true. You cannot call yourself a good Christian and hate your neighbor or call yourself spiritual and worship money. As Sartre (not quoted in this book) puts it, we are the summation of acts within our lifetime. The existentialist hits it on the nail and if only more people would replace lip service with actions, the world will be indeed a better place. We are living in the best of times. We have a relatively solid amount of knowledge about the world, the human body and ourselves; we have access to technology like never before and can reach millions of people at our fingertip, and the sky is indeed our limit. So let us all agree on love and accept ourselves (warts and all), accept our fellow beings (they also have their own warts but who are we to judge) and live in harmony within and without. This the message I take from this book, and I do recommend it overall. Lewis writes with passion and fervor, and it is quite intoxicating and contagious. Her message is very personal and I am glad she has the courage to share it with us. I also want to thank Drew Tharp for sending me a copy to review. Christians will surely find a lot to admire in this book, but non-Christians can also be inspired by the universal aspects of this book. "her own philosophy based on her personal experiences"
Yes, how many authors have foisted their self-help book based on the same premiss?